First off, Will kind of limped-dragged home a load of round bales recently — the wheel bearing on our hay transport had gone out. Now, our hay transport isn’t one of those nice (and expensive) Notch transports. It’s an old bus frame Will traded for some sawing lumber with our friend Mike. (It sat in Mike’s woods so long a poplar tree had to be sawed off to get it out of there.) But, hey, it’s done the job just fine up until now. The bearing had broken and parts had welded together as it got hot and generally made things a mess. It took Will two days of beating on a chisel against the 3½ inch nut, which had never been off there. Nobody had a socket that would fit it and finally Will pretty much welded up a socket to fit out of angle iron with a flat plate on top and a nut welded to that. The axle housing had distorted due to the heat so it was a terrible chore. But finally, today, it’s close to done as he’s working on getting the other side off so he can pack grease in that bearing. Luckily, our local O’Reilly Auto store had a bearing overnight that would fit. We were really surprised! (It’s probably a 1950’s International bus.) Meanwhile, I’ve been seeding out more tomatoes, canning more salsa, and harvesting dry beans like mad. It’s supposed to rain tomorrow, and boy, do we need rain. Even my lilac bushes are wilting as I’ve been so busy with the gardens I haven’t watered the front yard. (Yep, I did that this morning.) Whew! It’s times like this I wish I were triplets. 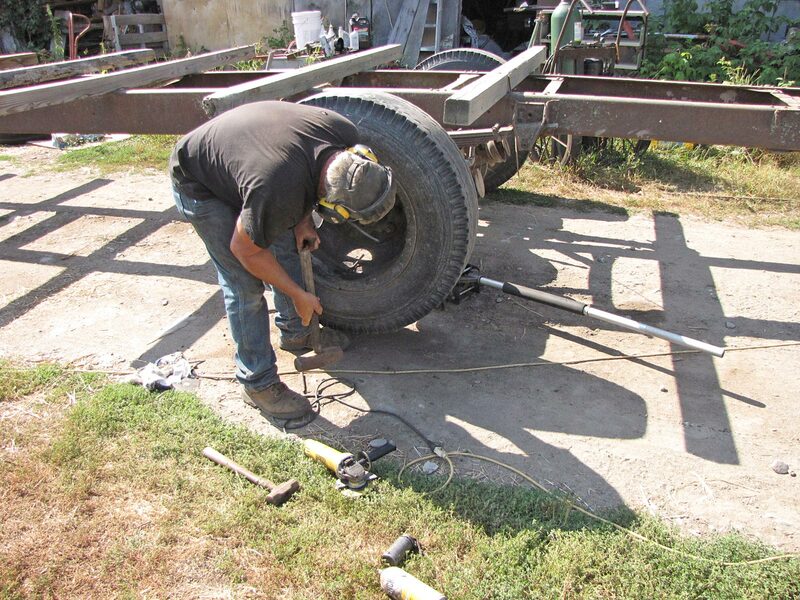 Will’s been working on the wheel bearings of our hay transport all week. Our first big Bill Bean tomatoes are ripe so we’re having BLTs tonight for dinner. I can’t wait for that. And no I’m not saving their seed. I’m going to eat nice fat slices. Aren’t you jealous? 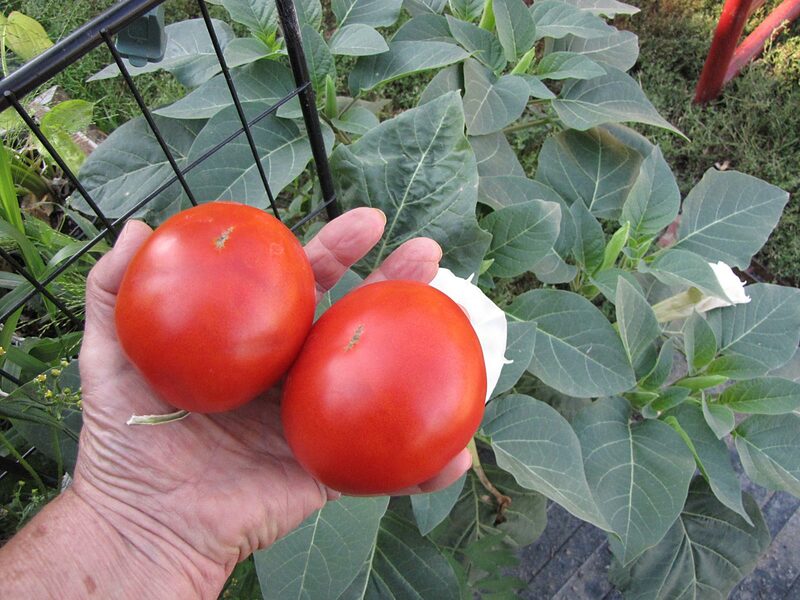 Check out these Early Rouge tomatoes. They’re early, productive, and tasty! You know, I’m glad our dogs have been well trained. A few nights ago, Hondo started barking his “something is out there” bark so I let him outside and followed with a flashlight. Wolf? Bear? Coyote? Nope. Hondo ran immediately to the side of the storage barn and when I flashed the light over there, here’s a SKUNK! Oh oh. Just then, Hondo saw him and I hollered “NO! Come here!” And he immediately turned and came — no spray. I was so thankful. I went for the .22, but when I came back out, the skunk was gone. And we haven’t seen him since. Luckily, skunks are not commonly seen at our place and I hope this one moved on. They not only spray your dog and cat but will eat eggs and kill baby chicks. I’m moving on from the Cowboy and Cowgirl Candy and tomato salsa to doing taco sauce as I’m full of the first foods on the pantry shelves. As the bulk of our tomatoes come in, I’ll be changing over to spaghetti sauces and other tomato sauces where I use my Victorio Tomato Strainer. And boy, do we ever have the tomatoes coming on! 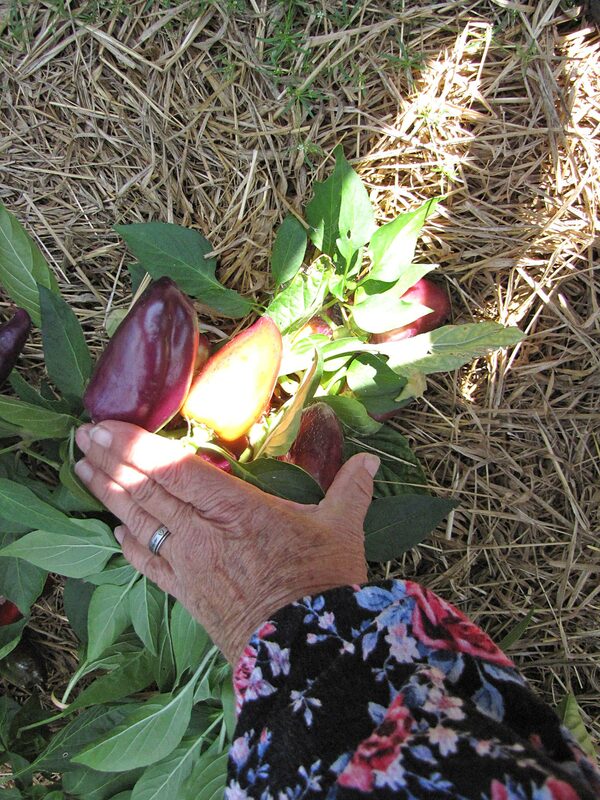 We simply love our Oda sweet peppers. Ohmygoodness! I WISH our dogs were as well trained as your sweet Hondo! We had a very elusive skunk living under our chicken coop that helped himself to eggs (and a few slow chickens) all throughout last winter. The dogs each got a face full of “skunk” on more than one occasion and had to spend the night on the porch! Thankfully my husband and youngest son were finally able to take care of that skunk this spring. We haven’t seen hide nor hair of any skunk since! Thank goodness!!!! Remind Will and anyone else out there how important it is to check your tires/bearings If you are towing a load very far-especially if you don’t use the trailer often. Husband (professional mechanic) taught us to stop a few miles down the road and touch bearings and tires. Fairly warm is ok, but not hot! If they light off and your trailer or bales ignite you have big, BIG problems. Stock trailers too! Yep, it’s one of those things you mean to do but don’t get around to it, especially when it’s only two miles and 20 mph or so. Definitely a good idea to check them. That sounds like the sort of thing my husband gets into. Usually it’s not ours, but another farmer’s piece of equipment he’s asked to work on. Glad to see Will has ear protection on. My guy isn’t always the best, as far as that. I’ve been canning too, and using your canning book as reference. Yesterday started with tiny plums, which was a bought tree, but seems pretty much like wild plums. I turned them into sauce, then tackled a large bowl of cherry tomatoes. I was pretty wore out last night, and said I didn’t know how women with children did it, back when you had to do it to eat. My husband reminded me those children were helping, which I suppose is true. I’ll have to check out those peppers. They’re gorgeous! Yep, harvest is in full swing here too. And, yes, kids used to help out a whole lot more on the homestead than most do today. They had to, in order that all would eat, come winter. Jackie, I was so surprised to see devils trumpet (Datura)growing and flowering in your cold climate. I never thought it would grow much past the Carolinas. I have those around my house. Call them moon flowers because they only bloom at night and the flowers die when the sun hits them. The only time I have the flowers last is if the temps are moderate (low 80’s) and it is cloudy. First time was this past week and a flower lasted two nights and one day. They are so pretty and smell wonderful. We are happy with our Datura although ours don’t have a fragrance. But they are gorgeous (although toxic! so don’t eat them!). Ours re-seed every year and seem to get better each year too. I got my start from our local hospital’s flower bed where I noticed them re-seeding. I feel for Will on that bearing, they are a pain to change in normal circumstances. Glad he was able to juryrig something to get it off with! So, if I wrote a book on Will would I have to tell the truth??? lol! This is the first year I grew your tomatoes from seed and I have never had so many tomatoes on one plant. We have been dry here in eastern wi to. Forecasting rain and cooler weather for tomorrow so I’ll b busy canning tomato juice and sauce. Also freezing sweet corn. This time of year I don’t know which way to go first. I hear you Sarah. Sometimes I feel like I’m spinning my wheels. But then I’m so grateful for our bounty I focus and get something done, instead.